I don't know whether 'vintage' make up is a thing or not, but this week's MAC Monday choice is definitely vintage! 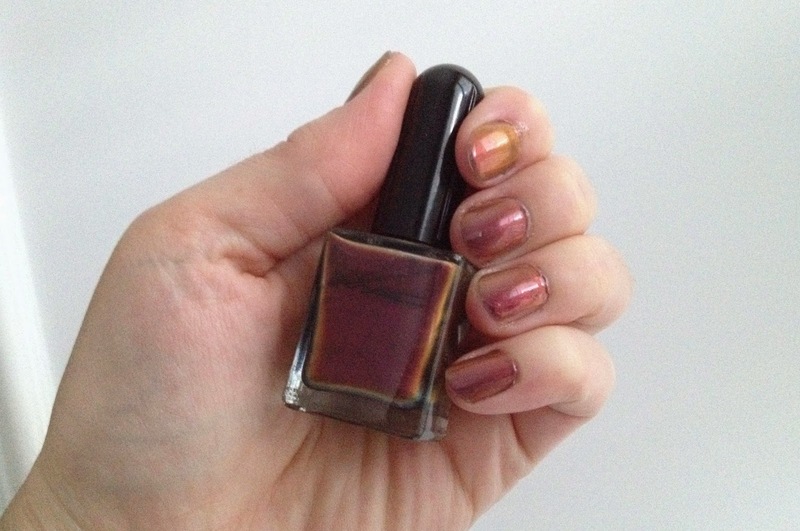 I mentioned this nail polish a few weeks ago during the weekly #30sbloggers Twitter chat (Sundays 9pm UK time), so I just had to review it soon. Not only that, but this nail polish was my first ever MAC purchase! 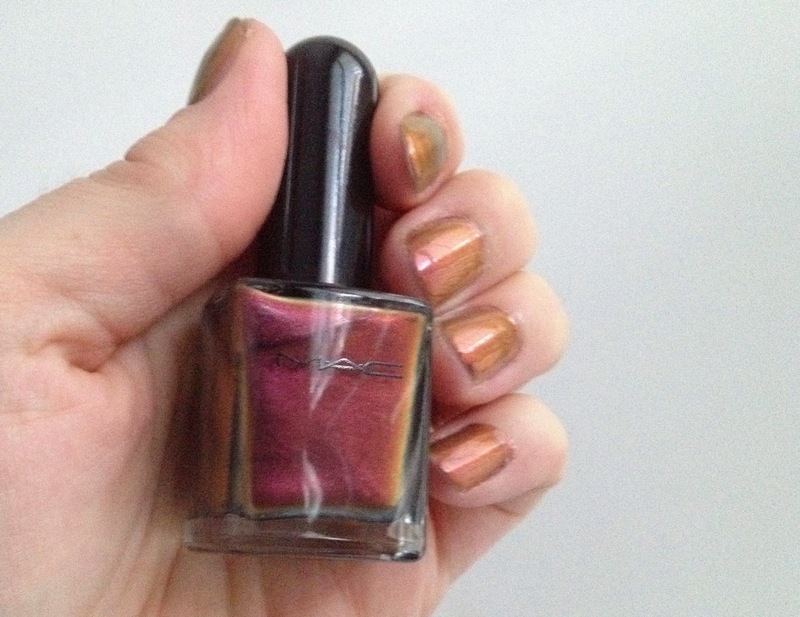 I bought the MAC Chroma Copper Cobra nail polish on a trip to London back in October 2000.... yes 2000 (I did say vintage!). To put in context how ancient this is - I was visiting the Millenium Dome when it was still an exhibition and not the O2 Arena as you know it now. I went with some friends and part of our adventure was a little shopping trip to Harvey Nichols. Desperate to buy something, I found myself on my first ever visit to a MAC counter - and it was this nail polish that caught my eye. 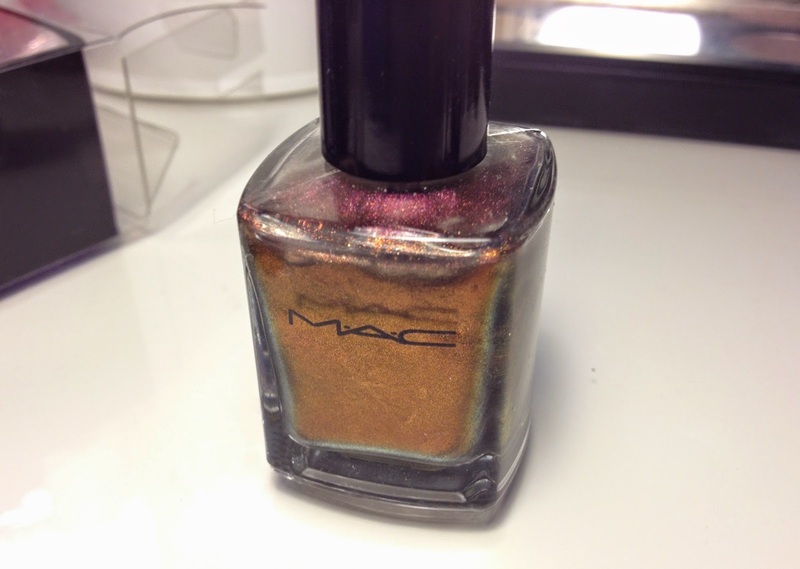 Chroma Copper Cobra was part of MAC's Snake Eyes Collection for autumn 2000. The collection featured eyeshadow, eye kohl and nail polish (the wonderful Temptalia has a good run down of the collection here). What was really striking about the nail polish was the amazing duo-chrome or multi-chrome effect. Don't forget back in 2000 this was a really unusual effect. I was amazed how the nail polish completely changed colour as it caught the light and I just had to have it. I know I winced at the price as I was a MAC virgin and back then I only owned a handful of cheap drugstore make up items. The formula is very thin and applies really well and very evenly. But it is very sheer. Once I had bought it I used it straight away and it was so sheer it didn't give the full effect I was hoping for. Forgive me, I was young and inexperienced but it didn't occur to me to apply a few more coats... Oh. 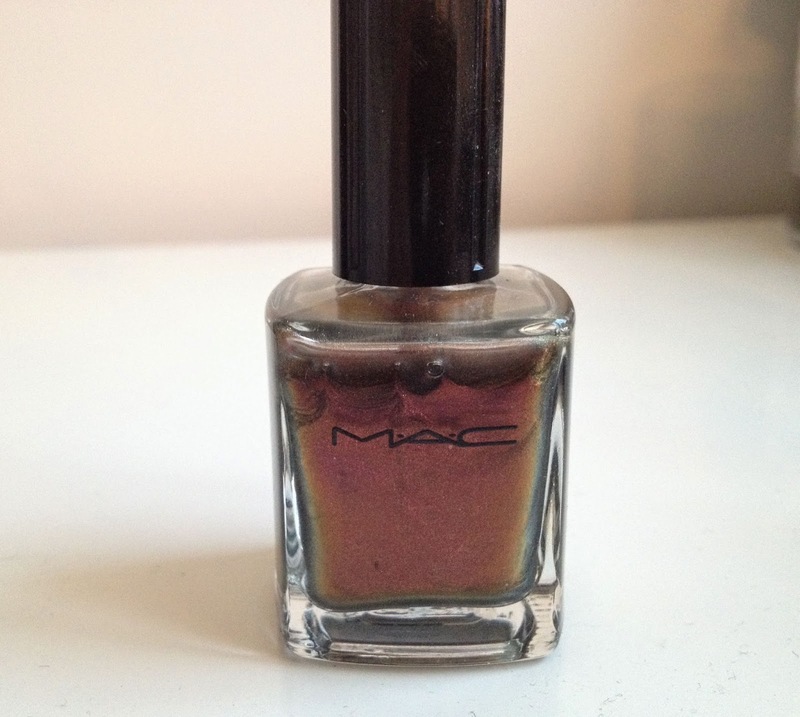 So my initially coveted MAC nail polish lay unused and unloved at the back of various cupboards for 14 years. Duo-chrome went out of fashion and only when the effect starting appearing again a year or two ago, did I remember good old Chroma Copper Cobra. Remarkably, when I dug it out of my stash a few months ago - it was still in really good condition. It hasn't turned gloopy and it still applies really well. Perhaps because the formula was really thin to start with. It is probably loaded with chemicals that are all out-lawed now but I still like it! Chroma Copper Cobra is described as a deep rustic, red multi-chromatic shade. Certainly in the bottle it looks like a rusty, bronze red with hints of gold and green as it catches the light. On the nails it looks paler, more of mauve with yellowy-gold. The green colour doesn't translate to the nails. Two coats gives a good colour although the colour may be more intense if you layer it up. I love that it isn't streaky and even after all these years the application is really good. Afterwards I used the Sally Hansen Insta-Dri top coat as always (see my full review HERE) because it really does dry in 30 seconds and I can't stand scuffing wet polish. I'm really amazed that this polish has lasted so long, perhaps because I only opened it a few times. I can only hope that a few more things in my collection hang in there for as long! 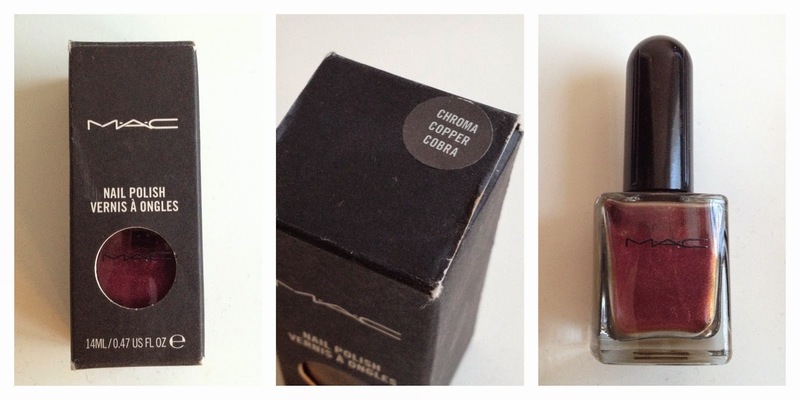 Do you have any 'vintage' make up items that you have rediscovered?